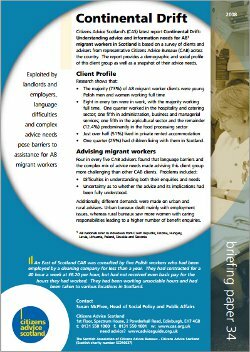 Briefing sheet which outlines the key findings of the Continental Drift report on A8 migrant workers and their advice needs. Citizens Advice Scotland’s (CAS) latest report Continental Drift: Understanding advice and information needs for A8 migrant workers in Scotland is based on a survey of clients and advisers from representative Citizens Advice Bureaux (CAB) across the country. The report provides a demographic and social profile of this client group as well as a snapshot of their advice needs. A8 nationals refers to individuals from Czech Republic, Estonia, Hungary, Latvia, Lithuania, Poland, Slovakia and Slovenia.